so....what did ya get lately??? Nice cymbal. Those old a's really do it sometimes. They're great!!! Most recent cymbal purchase is this 19" Bosphorus Masters Vintage ride. 1465 grams, so thin you can bend it in your hands. Dark, dry and trashy. Outstanding woody stick sound, trashy undertones and crashable in a very trashy fashion. It has become my main ride for small group jazz. great stuff guys. thanks for helping to get this going! 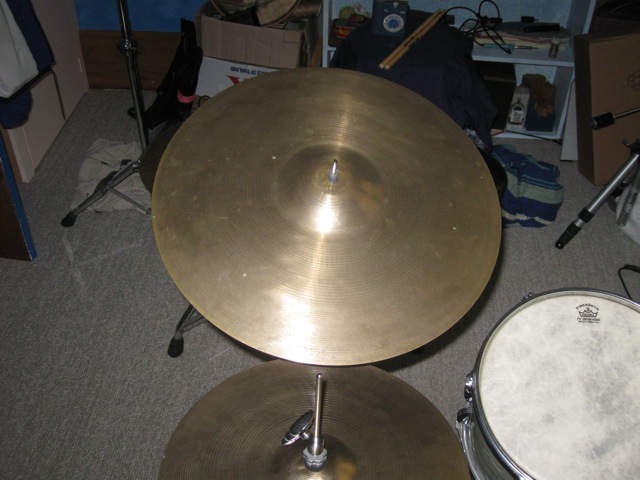 Most recent: Two days ago I picked up a Zildjian 20" K ride from a CL ad. The guy was on tour with a hip hop band and had placed the ad in the Asheville CL because that was the town they were headed for next. I met the guy at the Orange Peel (Asheville's main music venue) as they were unloading the trailer and played it there on the loading dock. The cymbal sounds great and it was fun getting to meet the guy and picking up the cymbal that way. Long ago: I bought a Slingerland drum set with a bunch of cymbals used back in 1980. I was a hard rocker. I beat the snot out of those drums and cymbals. I sold the set and cymbals back around 2000. Before then, I never had really researched what cymbal values were, and I noticed that one of the Zildjian rides happened to have a different looking stamp and somebody's signature underneath the bell. I'm sure you know what that cymbal was, by now. I sold it on eBay and it sold for exactly $1000.00 plus shipping to New York. One of you may have bought it, and if so, THANKS!. That was $200 more than I paid for the whole set, and it was at a time that I really needed the money because of financial difficulties I was having at the time. I just couldn't believe I had been hauling it around and playing it all those years without knowing what I had. It sure sounded good, though. Last cymbal purchase was a couple great Sabians that were bought from a recording studio engineer who happened to have marvelous taste in cymbals, and he let me have both for a good price. They're both complex gems, and pictured in your other thread. I stumbled across a little local drumshop a few months ago and picked up a 12" AAX splash. I didn't really need it so much, but I liked the shop and felt like throwing a little support their way. i got a 22" from classic vintage drums. I went on a bit of a G.A.S. rampage.. got the 20" K @1767g, a 22" trans @ 2270g, a 20" A @1965g supposedly owned by Barrett Deems, and the one below. I can pic and choose which ones I will keep and sell one or two most likely... they are all winners though!! Just picked up an 18" Paiste 602 Thin Crash, my first Paiste in 6 years! I got it through a Kijiji sale for $250! It's basically a brand new cymbal, as I bought it from a Paiste collector who never gigged, or really played it. No stick marks, no finger-prints..! I've been playing darker cymbals for a couple of years now, that to have such a bright, clear sounding cymbal took a bit of an adjustment for me to be comfortable with it. I had been worried that it wouldn't fit with my Meinls, but I'm totally in love with my 602! It pairs perfectly with my Jazz Medium-Thin and my Sand Ride. It's really an amazing cymbal, and I am so glad that I picked it up. I'm especially glad that I was able to get it for what is $200 off the price (after sales taxes) of a brand new 602 here in Canada, as the Canadian dealers jack up the prices, which is what has been stopping me from getting any of the 602's. I picked up this 12" pair of old A hats recently for a pittance... Top is a Trans stamp iirc and bottom is a typical 50s stamp. Both are thin and they sound great together. Witness marks make it look like they have been paired forever which makes me wonder if the mixed stamps left the factory together as a mated pair, or if they were matched at a store as often happened back in the day. Either way, for the little I paid they are fantastic. recently purchased a paiste 20 master collection series 20" dark ride cymal. it`s my first paiste cymbal and i`m more than happy with it. this cymbal has so many great sounds and i`m still exploring! i also ordered a paiste signature traditional series 16" thin crash cymbal. i patiently waited two weeks for it only to find out that the wrong cymbal was sent! that bummed me a little bit. anyway, it was reordered and sb in this coming thursday. can`t wait to hear it in person. For my birthday (end of July) I added a 1970s 18" Avedis Zildjian crash to my set of old As. Prior to this I've been using an 18" Trans stamp crash ride (at about 1562g) as an LSR but I also wanted to try out a true crash. The 1970s one is a svelte 1220g, dark and low pitched. It has the larger bell typical of real crash cymbals, although it also has a nice stick sound to it and you can ride it lightly. I bought it "on the rebound" from missing out on a couple of other ones locally. Those two were local (in the very depressed NZ cymbal market) and I was busy with other stuff and forgot to bid. So I missed out on an Armand Thin Crash 18" which went for $85 (USD) and a 17" K dark thin for $172 (USD). D'oh! Thanks to J1 for a quick and easy transaction. I did NOT need anything but: I got a 19" Armand AND a 20" Med-This "A" Crash. I have been wanting a larger than 18" crash for a while and went to Pro Drum and took three into the testing room. All were "A" 20" cymbals. Thin, Med-Thin, and Crash / Ride. The Med-Thin turned me on so I got it. Great crash / Great light ride! Here is the 20" after the black ink was removed! Most recent cymbal purchase - 18 Sabian SR2 Heavy, 16 Sabian SR2 Heavy. People told me it was dicey if I'd get good ones or not. I got 2 great ones. Totally pleased with both cymbals. Most recent purchase was a used K 18" ride from EBay...turned out to be an EAK @ 1560 grams! Definitely a keeper! No pics as I am out of town.